Cathie is a handsome mother of 65 (2002) and living in Old Mytic, Conneticut, U.S.A.
She is the mother of three children and married to Bob, an orthopedic surgeon. Cathie Jung's unfathomably dainty waist of 15 inches, is unique. The Guinness Books of World Records has inquired about it. Several times Cathie and Bob flew to Tokyo in Japan for quest appearances for the Japanese TV. In the U.S.A. and Western Europe they were also guests in TV shows. Cathie and Bob like to dress up in Victorian formal wear. They are fond of the elegant of this style of wear and are fond of cultivating and popularizing the wasp-waist. If possible, they visit every year the ball organized by the LGM. (Les Gracieuses Modernes). LGM is a community of persons who are fond of the elegant and feminine figure of ladies with tiny waists. Cathie Jung's corseted form has appeared on the pages of Life Magazine and the New York Times Style section. One of the photos shows Cathie in her sterling silver corset cover and worn over a lavish black gown. She has donned it for the annual Metropolitan Museum of Art's Costume Institute party fot the opening of its Versace show. The Jung's like fishing and with their boat "The Bobcat" they make a lot of nice fishing trips. Cathie wearing her sterling silver corset. 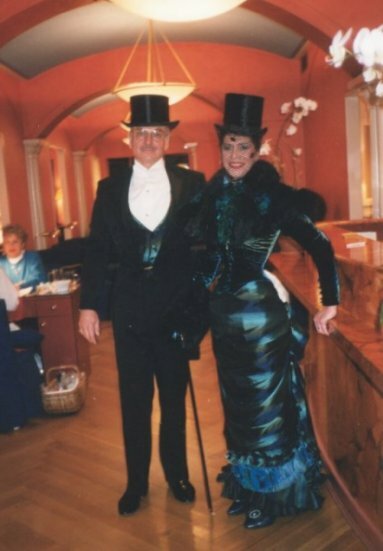 Bob and Cathie in their Victorian Costumes. 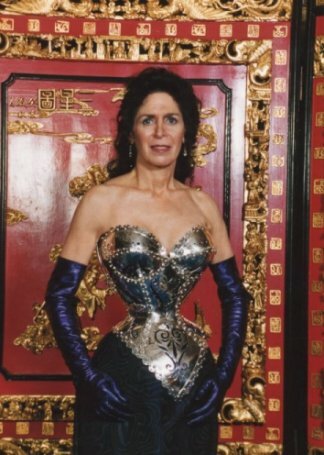 Of course Cathie is wearing her corset, as she has for virtually every hour of the day and night for the last 20 years. The only time that she is not wearing the corset is probably the hour it takes her to shower and dry herself thoroughly. Cathie is devoted to corset training, or what she also calls waist training. Cathie was married in a corset 42 years ago, and though she wore one on occasion during early motherhood, she did not pursue the exquisitely hour-glassed figure of yesteryear until her children were beyond the age of being embarrassed. Her uncorseted waist today is 21 inches around. It was 28 inches when she began to be reconfigured artificially and habitually. With a normal waist of 28 inch you start with a corset of 25 inch. When you get comfortable you go to a 24-inch corset. Then a new one two inches smaller. Cathie is now to a 15-inch corset. Cathie is 5-foot-6 and weight 135 punds. She owns more then 25 different corsets, some of cotton brocades and others of Chinese silk. Leather is also comfortable and wears well. Under the corset she is wearing a camisole or a chemise. Powder is also important. 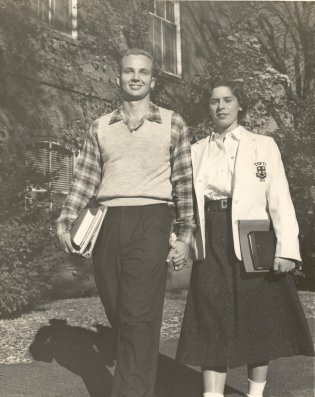 Cathie and Bob met at Tufts University, where Bob earned an undergraduate degree and attended medical school. Cathie studied biology at Tufts. Cathie has suffered no ill effects from wearing a corset virtually 24 hours a day for the last 20 years. In fact, it has bolstered her spinal support. Bob Jung says: "As for the ribs, you would be surprised by how much the chest is not impacted. Only the two lower ribs, but those are the s0-called floating ribs, two on each side. Everything in the middles is flexible. The bowed and the stomach are hollow. One concern is dry skin and keeping the corset clean. The bidet is for Cathie a real blessing in the wintertime, when you don't need to shower every day. Showering all the time dries out the skin. Cathie, as a young girl, spelled her nickname with an "ie" instead of a "y" because the latter letter descended to the next line and got in the way of her writing. Cathie never has had surgery to help attain her waist. But it is not just about the waist size. It is the illusion that matters. The difference between the hips and the waist, the chest and the waist. It is all about accentuating the natural and beautiful curves of the female figure. Cathie in a black brocade corset. The diet of Cathie is pretty normal. She feels full or satisfies very quickly but she enjoys it very much to visit a restaurant.